I am recently having problems with a print that used to go (almost) perfectly fine. It is a long PLA print (> 10 hours). As you can see, the extruded filament makes a small "ball", which I'm almost sure corresponds to the extrusion curling around the nozzle instead of falling straight down (I've already seen this happen, at the beginning of a print). Then at some point it's too heavy and detaches itself from the nozzle and falls down, until it breaks and starts over again. Maybe this is the beginning of the problem, and what I described above the consequence, I don't really know. For your information, this does not happen always at the same time during the print, it really varies. And some times, not every time, I find that the print has fallen on the side. 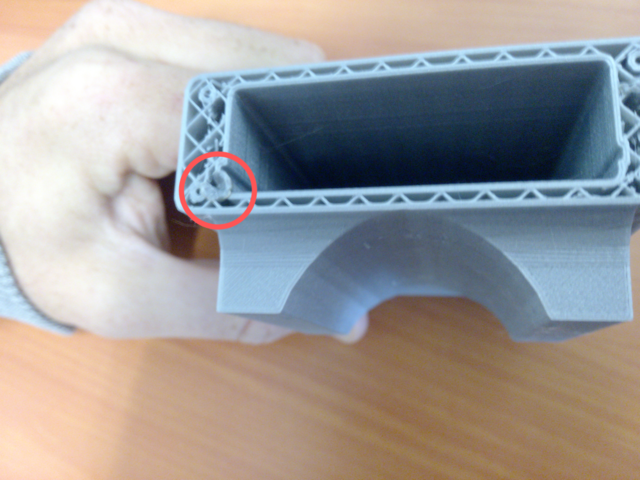 Another type of problem that I have sometimes (regularly but not systematically and that I have failed to solve yet) is the "skipped layer" problem (http://support.3dverkstan.se/article/23-a-visual-ultimaker-troubleshooting-guide#z-drop), maybe it is related? Maybe some of you have ideas of things I could try, or method I could set up in order to identify the cause. The only way filament will ball up and fall off the nozzle is if some other problem occurred a while earlier and the nozzle is up above the print. So this is not something worth worrying about - the main cause of why it stopped is more important. If a piece falls over - this is most likely a totally different problem. This happens a lot. The best fix for it is to get the part to stick to the bed better. I would start with brim - do you use the brim feature? Set it to about 10 passes. If part is still knocked over it is too tall and you need to either rotate it 90 degrees or add some diagonal supports that go from the bed up half way the print. That nozzle hole is scary. I don't know what would cause that and I don't think I've seen that before. It seems like the Z axis - the bed - would have to move upwards into the nozzle suddenly for no reason. This can happen if you print USB - do you print through USB? That is not recommended and not officially supported. Or if your gcode is corrupted (never heard of this before). Having the printer stop printing for no reason is also common. It can happen if your filament is brittle and cracks or if you print too hot (>250C) and too slowly (especially a problem with non-PLA filaments). It can happen if dust/dirt gets into the nozzle. If you have too many retractions and filament is ground to dust at feeder. 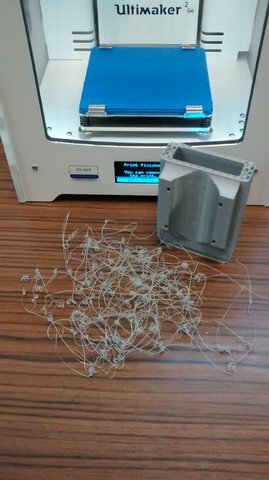 If you get a tangle in the spool of PLA. Yes I'm using brim, but I've printed like more than 20 of these pieces before this problem happens, with same settings, and same brim, so I'm not sure it comes from that. The nozzle hole is what I fear most. I haven't read anything about that anywhere. No I'm printing from the SD-card, not from USB. Corrupted gcode seems strange, I actually haven't modified if for a long time, I always print the same piece, the .stl is on the SD-card, I didn't modify it. Due to a slight design flaw of a revision of the controller board it's possible that some printers will have a problem where excess current to the stepper drivers cause issues. What happens is that the stepper drivers overheat, the protection circuitry of the chip kicks in and shuts the driver down for a brief moment, during this moment there's a chance that the bed moves down unpredictably. Thankfully this is usually easily fixed by simply lowering the current for the stepper motors. This is done on the printer via Maintenance -> Advanced -> Motion settings -> Current Z. The default value is 1300mA, try lowering this to 1200mA. That particular piece detached from the bed or not? I was wondering the same thing. If the part came loose and the head dragged it around the bed then it would explain a few things you experienced. A good way to clean the nozzle is with an "atomic pull". Google around for more info on that. Also called a "cold pull". Thanks DidierKlein, I will try lowering the Z current value, but the solution you give says that "the bed can move down unpredictably", and in my situation I think that it's the opposite, it seems that the bed moves up since the nozzle makes a hole. Anyway I will try to see if it helps. I don't think that the hole can be done by the head that stops moving, it is quite deep, like 4mm, and really has the shape of the nozzle (they fit nicely one into each other). That particular piece may have fallen, I don't remember, but I have a second piece where the same problem occurred and I know that it didn't fall. One last thing: on the one that had fallen, I remember noticing "warping'. The bottom of the piece was not flat, it's corners were bent. I don't know if it fell because of that or if it happened after falling. All I can say is that the bottom had been printed many hours before the problem occurred (like halfway of the total 13h). As I said previously, I've done many atomic pull... I won't have much time next week to work on it, but I will try out what you say and come back with more info as soon as I can. From looking at your part I don't think the corner-warping could have lifted the part enough to cause the head to melt a hole in it. However what you describe - corners lifting - is a common problem and pretty easily solved. But not what you asked about earlier (bed moving up and down for no reason). There are many solutions that work great. The problem is that PLA shrinks as it cools and the upper layers are pulling very hard horizontally which lifts the lower layers. 1) Make sure the glass is clean if you haven't cleaned it for a few weeks. You want a very thin coat of PVA glue which is found in hairspray, glue stick, wood glue. If you use glue stick or wood glue you need to dilute it with water - about 5 to 10 parts water to 1 part glue. So for example if you use glue stick, apply only to the outer edge of your model then add a tablespoon of water and spread with a tissue such that you thin it so much you can't see it anymore. wood glue is better. hairspray doesn't need to be diluted. When it dries it should be invisible. This glue works well for most plastics. That "nozzle hole" in your part is really bothering me. I've never seen that before and I have to agree the only thing I can think of to cause it is if your Z moves suddenly and forcefully for an extended time (maybe 2 seconds) in the wrong direction. I definitely like the idea of lowering the Z current because that is so easy to do but most people see the power simply turn off with that issue. Still it's worth trying. But for me I think I would ask for a new PCB from Ultimaker. If you go this route contact them at support.ultimaker.com. One other possibility - if the part came loose from the glass and the head was dragging it around for a while but the part was tilting a bit back and forth at the same time? Could that cause the head to dig into the part. Probably not. Your part is very tall and thin so I think it would more likely just fall over.